Since 1978, Kitchen Economy has been Cardiff’s local Euronics provider of high-quality home appliances. They work closely with some of the biggest names in white goods including Beko, Zanussi, Cannon, Belling and Hotpoint. Alongside selling a wide variety of these great products, they also have a dedicated spares department to help fix any issues you may have with your appliances! They work to provide the best possible service to Cardiff and the surrounding area and you can find them situated in their long-standing appliance store in Roath. 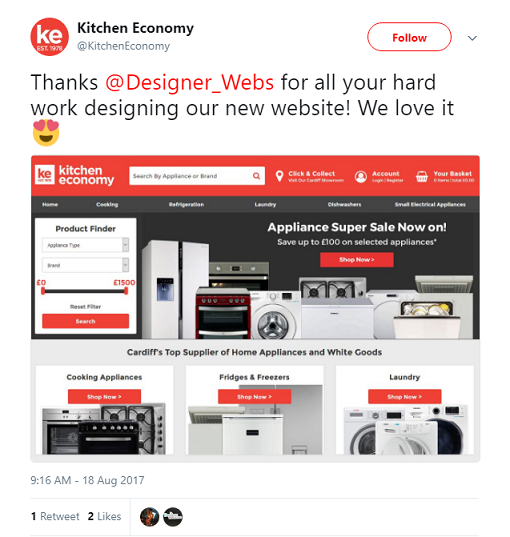 As they aim to cater to each and every one of their customers, Kitchen Economy opted to go for a full redesign of their website to make it as user-friendly as possible. They found their old website had become out-dated and came to us to achieve a more modern look for their brand. Alongside a fresh new look, they also wanted their website to become fully responsive across all devices. Our design team worked to provide a modernised version of their existing functional e-commerce website. The redesign included making the website more visually appealing, with large and high-quality images, alongside clear call to action buttons. We also integrated the Kitchen Economy blog onto the category pages to provide new and useful information while customers browsed the website. Looking to compete with the likes of AO and Currys with their modernised new design, we worked to provide a responsive, secure and attractive new website. The Kitchen Economy website is now served entirely over HTTPS, meaning that all information users send via the website is encrypted and secure. We are very proud of the new website and if you’re in need of any new electrical appliances, we’d love if you checked it out today! Are you also looking for a fully responsive, secure and SEO friendly website? If so, get in touch with us today for a free quote. However, Google have now announced a major change that could cause a lot of problems for website owners. As of October 2017, the 'Not secure' warning will appear on EVERY non-HTTPS page that contains a text input form, regardless of the form's purpose. Basically, if your page contains ANY element that allows the user to enter and submit some sort of information - whether it's their credit card number, their email address, or the name of the product they're looking to buy from your website - then you'll need to get that page secured with an SSL certificate by October. With this change looming on the horizon, a lot of website owners will need to think very seriously about implementing HTTPS across all pages if they have not already done so. For instance, it's quite common for ecommerce sites to use HTTPS on their login/register and checkout pages while serving all other pages over an unsecured HTTP connection, but once this Chrome update takes effect, the people who visit those websites will start seeing 'Not secure' messages everywhere they click. And those two little words will often be enough to put off potential customers and send them running to a fully-secured competitor instead. If you are currently serving text input forms over an HTTP connection, you will need to purchase an SSL certificate and install it on the server where your website is hosted. You will then need to update things like canonical tags and internal links so that they point to your website's new URL (beginning with https:// rather than http://). You will also need to ensure that the proper redirects are in place so that anyone trying to access the HTTP version of your website is automatically sent to the secure HTTPS version. Do I need to switch to HTTPS if my website doesn't contain any forms? Perhaps you've been reading this and thinking 'this doesn't concern me - I don't have any search bars, contact forms or anything like that on my website, so I must be safe'. If so, we have some bad news for you. Google have made it quite clear that the October update will merely be the latest step towards their ultimate goal, which is to mark ALL HTTP pages as 'Not secure'. "The new warning is part of a long term plan to mark all pages served over HTTP as 'not secure'." So while your unsecured website may survive the update in October, you won't be able to escape that 'Not secure' shame notice forever. And given that users are increasingly expecting to see that little green padlock at the top of their screens no matter what they're doing online, it's probably a good idea to get that SSL certificate and upgrade to HTTPS sooner rather than later. Further Reading: Why Convert Your Website to HTTPS? Should You Outsource Your Digital Marketing Strategy? You may also choose to combine the above strategies with more traditional avenues such as TV, radio and/or print advertising. With the fight happening on so many different fronts, it's not hard to see why a lot of business owners decide to outsource some or all of their marketing to external agencies. Indeed, it's not uncommon to hire a different firm for each task: one company to design your website, another to write engaging content for your blog, another to handle your AdWords campaigns, and so on. But is this a good way to get results? 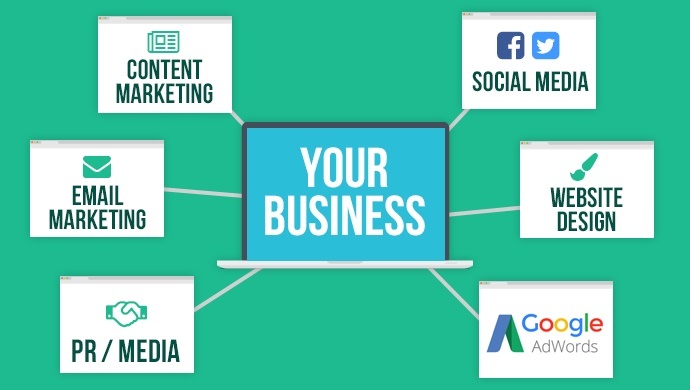 The obvious benefit of this approach is that it allows you to hire a specialist for each part of your multi-platform digital marketing effort. You want a professional-looking website, so you hire an experienced web developer who's capable of providing this. You want to get your brand name in front of more people, so you pay a highly-rated PR agency to get the word out on your behalf. Nobody in your organisation knows the first thing about Google AdWords? No problem - hire a PPC expert to set up some campaigns for you. On the face of it, then, choosing the best person or company for each job on a task-by-task basis seems like a pretty sensible tactic. The problem is that while PPC advertising, SEO copywriting, website design, et cetera are all distinct disciplines that require very different skillsets, they don't exist independently of one another. All digital marketing platforms are intrinsically linked, and trying to separate them all out can cause a lot of headaches. Search engine optimisation (SEO) is a critically important part of website development that ideally needs to be taken into consideration at the planning stage. When building a new online home for your business, you might be tempted to hire a designer to create the website itself, then turn the project over to an SEO expert who can select the keywords and write the copy for each page. As a general rule, though, you'll definitely get far better results in the end if your website developer has a strong working knowledge of SEO too - that way, they can make suggestions from the get-go and help you to construct a highly-optimised site hierarchy instead of just hashing in some keywords as an afterthought. Optimising a website is significantly more than just content and keywords - it’s having a modern and responsive site architecture, handling URLs properly, hosting the website in a way that make it fast for the end user, and so much more! If you're thinking of using Google AdWords to drive extra traffic to your website, you may be wondering exactly how much each click will cost you once your ads are up and running. The answer to that question depends on many different variables, but more than any other factor, the amount you pay when somebody clicks on one of your ads is determined by its quality score, which is derived from the combination of keyword, advert and landing page. The lower your quality score, the more you'll have to pay for each click (since Google don't like sending their users to irrelevant or low-quality web pages). But your average PPC manager can't achieve a good quality score just by fiddling around in AdWords - it requires collaboration between your web developer, copywriter and PPC manager to get those ads and landing pages just right. Finally, let's imagine that you've hired a social media guru to grow your audience on Twitter, Facebook, Instagram, and so on. In order to craft successful social campaigns and keep your accounts running smoothly, that person will have to co-ordinate their efforts with the person who writes your blog posts, the person who handles your PR, and possibly several other parties like your web developer, your sales team, and whoever is responsible for determining the overall direction of the company. That's a lot of plates to keep spinning! Of course, there are numerous tools and pieces of software that can be used to co-ordinate several groups of people who are all working towards the same goal, but these solutions tend to only work as well as the people using them. No matter how you slice it, trying to synchronise half a dozen different agencies and get them all reporting back to you in perfect harmony can be a huge and frustrating task! 1) Hire in-house marketing talent. Instead of outsourcing your marketing efforts to external agencies, you may decide to hire your very own PPC expert, SEO guru, social media manager, etc. That way, all the necessary skills will be in your own office and on your own payroll. The drawback: Hiring your own marketing team will cost a lot of money and use up a lot of time. You'll have to do all the legwork - posting job ads, looking through CVs, interviewing applicants - yourself, and if you're hiring several people, you'll have to do it all multiple times. Successful candidates might need to be trained up, and they may take some time to properly settle into your organisation. And that's assuming you can even find the talent you need. Unfortunately, most skilled digital marketing professionals would rather work for an agency (where they would get to work on a variety of different projects) than for an ordinary business (where they would have to the same thing every day). If you do choose the in-house route, you may find that scouting out a suitable candidate for each position is harder than you expected! 2) Find an agency that does everything. Hiring an agency means that you don't have to face the hassle of recruiting new employees for your own company, and if you can find an 'all-in-one' digital marketing agency who know how to craft engaging content, build successful AdWords campaigns, get seen on social media, AND design a winning website, this will also make it far easier for you to keep your digital marketing efforts tidy, efficient and effective. The drawback: Marketing agencies that do everything are hard to come by. It's fairly easy to find a company that's great at SEO, or at social media, or at pay-per-click advertising, but finding a company with the skillset and vision necessary to do it all - and do it well - can be quite a challenge. Additionally, some business executives may be reluctant to put all their eggs in one basket by entrusting absolutely everything to a single company. Will they be vigilant, honest and communicative when it comes to reporting back and keeping you in the loop? And what if this other company were to go under? Where would that leave you, the client? Clearly, both of the above approaches have their pros and cons. But there is a third option: simply take a little from column A and a little from column B. 3) Hire a skill-rich agency and your own marketing executive. First, you hire a talented person to serve as your company's internal marketing executive. This person will need to have great communication and planning skills, along with a good deal of digital marketing experience, but they don't necessarily need to be an expert on everything. They won't necessarily be the one setting up AdWords campaigns and tweeting the latest blog posts - their main role will be to co-ordinate your overall marketing strategy and communicate with the people carrying it out. Once your new recruit is in place and the two of you have come up with a digital marketing plan that identifies goals and highlights key areas of priority, the next step is to find a digital marketing agency that's capable of delivering on your aspirations. You should still look for a company with a diverse array of skills at their disposal - after all, our original point about the multifaceted nature of modern marketing still stands - but since your internal marketing executive will be working closely with the external marketers, you don't have to worry about drifting out of the loop. This approach is superior to the others for a number of reasons. Yes, you'll still have to interview, hire and orient a new employee, but it's just one person rather than a whole team. Yes, you're still entrusting much of the actual work to an external company, but it is just one company - which should keep things relatively straightforward - and you'll have a dedicated employee of your own to hold them to account, answer any questions they might have, and track their progress to ensure that your overarching marketing strategy is moving in the right direction. Done correctly, this approach will ensure accountability, straightforward two-way communication, and steady forward progress towards your digital marketing goal. Designer Websites is a talented team of developers, designers, SEO specialists and digital marketing experts. No matter what you're looking to achieve online, we have the skills to help you do it - contact us today to discuss your requirements. With billions of daily website views coming from traffic on search engine results pages, SEO (Search Engine Optimisation) is vital to any digital marketing plan. Across the globe, businesses desperately strive to achieve the top spots on Google's SERPs (Search Engine Results Pages) in order to generate the most traffic to their business. However, in order to achieve these positions, it is much more complicated than simply having a fast website or just targeting keywords. With the most popular search engines constantly tweaking and altering algorithms, businesses are constantly kept on their toes in an efforts to master SEO. There is no quick fix to achieving and maintaining a space on the front page of SERPs (no matter what some dodgy SEO companies may tell you!). It takes a combination of techniques to fully optimise your website. Ultimately your website should be very easy and quick to use, it should contain valuable unique content, it should be hosted professionally, it should properly handle errors, redirects, sitemaps, indexing bots, etc. In fact the list of boxes that your website should now tick is very long indeed, and most of these elements are very technical and will need properly qualified and experienced people to implement them. SEO now comes hand-in-hand with user experience optimisation, and Google will no longer accept cheap tricks to get to the top of the results page. Instead, Google explains that: "Search engine optimization is about putting your site's best foot forward when it comes to visibility in search engines, but your ultimate consumers are your users, not search engines." With that in mind, when considering how to SEO, below are some things to consider. Although we’ve already mentioned it’s not the only way to help rankings, it remains a very important part of SEO. It involves researching what people are searching on Google when they’re looking for a service like the one your business provides. Then you can target this traffic by having the keywords appear in all the right sections of your website (such as the title tag, Meta tags, page headings, etc) and ads. In the not too distant past, website optimisation experts were often guilty of filling up pages with keyword-rich copy, but these days it's absolutely vital to make your content more user-friendly and readable, but this doesn't mean you forget keywords altogether, it just means you need to work harder to include appropriate keywords, whilst making the content engaging. Copywriting is a balancing act between targeting keywords and providing interesting and useful content for the user. No one wants to visit a website that’s full of useless information, and Google will penalise you for cutting corners. Instead of flooding your copy with keywords, it’s key to maintain readability and an appropriate keyword density. To ensure your website can be easily indexed by search engine bots, and that it will run at an optimum speed, it’s important to get your coding correct. You want code-light pages that load very quickly, you need to use the latest compression algorithms, you need to utilise the latest coding standards and include important meta information, rich cards, schema tags, etc. If you want to rank highly across different browsers, your coding has to up-to-date, it has to be responsive to ensure it works on any device, and is cross browser compatible. Avoid template type solutions, or systems where the coding structures are likely to be old and out-dated. Providing super fast and reliable website hosting is absolutely essential to a well-optimised website, otherwise, all of your other SEO efforts will have been in vain. Correct error handling procedures and redirecting is also really important. You either need a dedicated web server or at least a host who has a very high end dedicated server and holds fewer than 50 websites on it themselves. The speed of the server is significantly more important than it's location, so make sure that the response times are very good. Not to be confused with dodgy link-building of the past – a technique that led to a steady stream of dodgy links spamming the internet (through directories, etc), which is now often branded a black-hat technique. Trying to acquire links synthetically can earn you a Google penalty, which can get you removed from SERPs. However, there is still value in worthy links that are achieved by content creation specialists liaising with site owners. Google still uses inbound links as a part of their algorithm, but now they are more interested in the value of these links rather than the quantity you've amassed. Make sure you avoid any dodgy link building tricks, just focus on networking effectively, and making sure your content is interesting and easy to link to. Ideally, generate content that naturally generates links and shares from real users. With the majority of people checking their social media before they’ve even got out of bed, it’s now more important than ever to make sure your business is within the social matrix. Although there is still some debate about how valuable (if at all) social media is, it's good for brand awareness and potential back links. By having a well-oiled social marketing plan, you can potentially improve your rankings on the search engine results, so it's worth doing! Another development that highlights how SEO is constantly evolving to fit in with the daily lives of users. Search engines such as google value the way your website translates onto other devices such as mobile phones and tablets. When considering how to optimise a website the above is simply a brief introduction, and is by no means a comprehensive list of techniques. Website optimisation is actually a varied and a constantly evolving process, which requires the expert knowledge of SEO practitioners. Here at Designer Websites, the wealth of experience we have developed over the past decade ensures we understand the technical aspects of website optimisation better than anyone else. Click here to learn more about our SEO services or request a free quote for our SEO services here today.